R.I.P. December 2, 2018, peacefully, after a short illness surrounded by his loving family, dearly loved husband of Mary, loving dad of Grainne, Barry-John, Claire and Mairead, their partners Charlie, Tanya, Paddy and Roddy, pround grandad to Dara and dear brother to Rosemary and Oliver, also brother-in-law to Peggy. Finn's remains will leave his residence, 9 The Roddens, Larne on Monday at 12.30 p.m., to arrive at St. Macnissis Church for 1.00 p.m. Requiem mass, funeral afterwards to Roselawn Crematorium for 3.30 p.m. Committal. 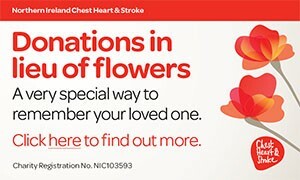 No flowers by request donations in lieu, if desired, to N.I Chest, Heart and Stroke Assocation, 21 Dublin Road, Belfast, BT2 7HB. Will be sadly missed and foundly remembered by his loving family. I am sorry to tell you that Finn (Peter Finian) McCANN has passed away.